I’ll be honest: This is as much a shrimp and andouille gumbo as it is a turkey gumbo. And what’s more, there isn’t any reason you can’t substitute whatever meat makes you happy for the turkey. But this does happen to be what I think is an excellent gumbo recipe, and it is undeniably a great use for turkey drumsticks, wild or store-bought. 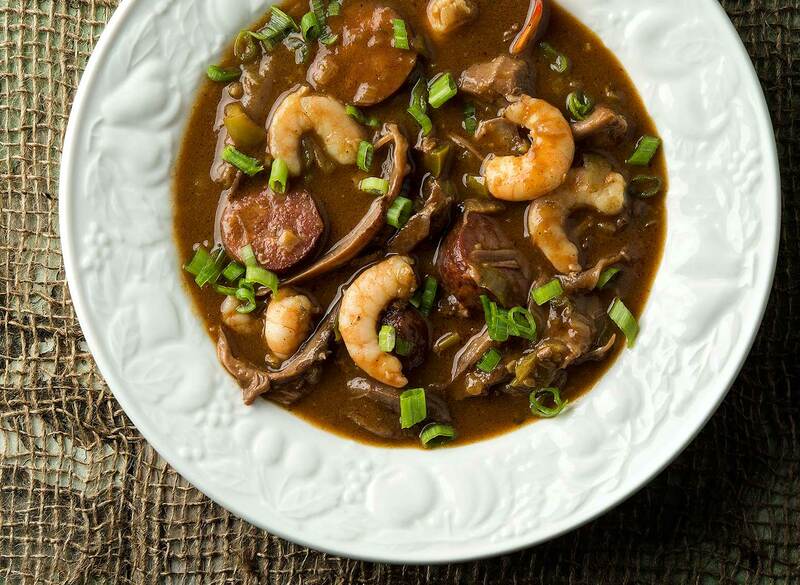 Gumbo is one of those stews that everyone makes in their own way. I happen to prefer a more Cajun method, with a dark roux and not much tomato, if any. The roux (pronounced “roo”) is a mixture of fat and flour that thickens the stew and, when you cook it to the color of dark chocolate, adds a distinctive flavor. All gumbos use a roux, either as a base of stirred in at the end, and all gumbos employ the Holy Trinity of onion, green pepper, and celery. Most use garlic, too. And almost all gumbo uses at least one of the three thickeners: the roux, okra or filé, which is dried, powdered sassafras leaf. Rarely will you see all three in a gumbo, however. Meat is where it gets crazy. You can put pretty much any meat you want in a gumbo, and most include more than one. This turkey gumbo is pretty typical in that it has the main meat — turkey legs and thighs — plus something smoked, in this case my homemade andouille sausage, and a seafood like shrimp, crab or crawfish. I do not advise using turkey breast here, because it doesn’t take well to long stewing. If you must use turkey breast, dice it into pieces you’d want to eat, then toss it into the gumbo in the last 10 minutes so it won’t dry out. 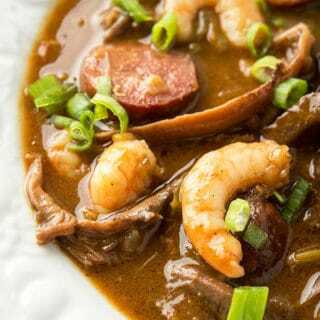 Gumbo is usually served with steamed, long-grain rice, or potato salad. A Dixie or Abita beer is a good accompaniment. 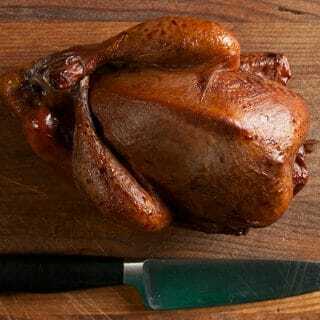 Gumbo is one of the great uses for a turkey drumstick. I use homemade andouille and Gulf shrimp from Alabama, but any good American shrimp and smoked sausage will do; tasso ham is another good option. And feel free to put any and all meats you want in here. I use filé powder here to thicken my gumbo, but you can skip that and use ½ pound of okra instead. Pour the stock and 1 quart water into a pot and bring it to a simmer. In a large, heavy soup pot, heat the peanut oil over medium-high heat. Stir in the flour to make a roux and cook this, stirring often, until it’s the color of milk chocolate. You’ll need to stir this more often as it cooks so it doesn’t burn. This should take about 15 minutes. Add the diced vegetables and the garlic, and mix well. Let this cook over medium heat until soft, about 10 minutes. Stir in the tomato paste, celery seed, bay leaves, and Cajun seasoning. Bring the stock to a full boil and start adding it ladle by lade into the soup pot. It will sputter and seize up at first, but keep adding the stock until it has all incorporated. Bring this to a full, rolling boil and let this boil for a couple of minutes. Turn the heat back down to a simmer and add the turkey drumsticks. Taste for salt and let this simmer until the meat wants to fall off the bone, a couple of hours. Remove the turkey legs and pull the meat from the bone. Add the sausage, shrimp, and okra or about a tablespoon of filé to thicken, and let this simmer 5 minutes. Add Tabasco to taste and serve garnished with green onions over rice. 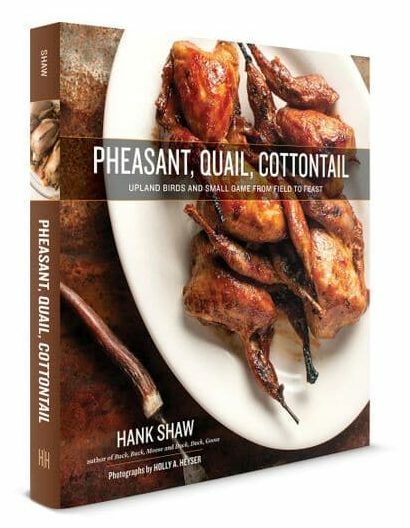 You can find all sorts of recipes for wild turkeys and other upland game right here on Hunter Angler Gardener Cook! I guess my original post did not make it. The correction was using a cup of butter or oil instead of a half cup. Used ths gumbo recipe in DDG to verify. We had the same issue as Tom. I was fortunate to live in Cajun country for a year when I was young. My mother was a great and ever inquisitive cook who took to Cajun food and thus gumbo, dirty rice, jambalaya etc. became regulars at supper time as I grew up. Gumbo is a favorite in my house to this day. Always eaten with long grain white rice until,”drumroll”, I tried it with hush puppies! Talking about simple hot water, cornmeal,salt, hush pups. Fry em up, break a couple up in your bowl, ladle gumbo, onions, parsley, a little Tabasco,whatever you like. Ce Bon! Really enjoy the site. Making gumbo from this recipe the 2nd time. My crowd likes it. Only change I make is to use peanut oil(used it to fry a turkey) instead of oil or butter. This recipe is absolutely delicious! Creamy, with a favor that melts in your mouth. I substituted rabbit for the turkey. It was a great success. I think about making this often, wait! Why am I just thinking about it? I should just cook it again!